Do you know what Driver Performer is? Driver Performer is an application which is claimed to scan the PC and find what drivers are necessary in order to enhance the performance of the hardware. The application is said to help to avoid system crashes and sluggishness which is cause by the shortage of up-to-date drivers of the various devices of the PC. Driver Performer performs a scan of all the devices connected to the computer and search a driver database for the drivers that relevant to your operating systems. Nevertheless, all these characteristics do not mean anything to the majority of the users who have installed this application as it turns out to be a useless tool. Once the user installs Driver Performer, he or she find that the system starts running sluggishly; for example, it cannot start up normally, and the system scans do not show adequate information. The majority of the problems may not be fixed. If the user wants to have drivers installed manually, he or she has to buy a premium version of the program which is a waste of money. 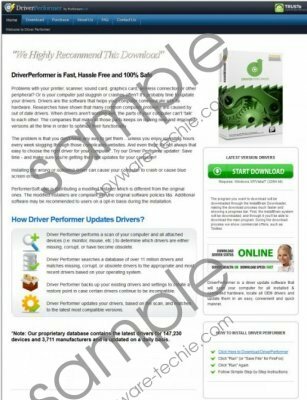 If you have already realized that Driver Performer is of no use, remove from the system without hesitation. The application is available at driverperformer.com, performersoft.com, softonic.com, cnet.com and many other sources. Moreover, it can get to the computer via drive-by downloads which also refer to the instances when the user installs an application without a clear idea of what the consequence of the installation will be. If your Windows Firewall is not activated or if you do not have a reliable spyware removal tool installed, the risk of accidentally installing Driver Performer is much higher than in the cases when a computer is protected by a professional anti-spyware removal tool. When it comes to the removal, the uninstall package may not be listed in the Add or Remove Programs list in the Control Panel utility. If you cannot remove it through Control Panel, implement SpyHunter which will remove Driver Performer and safeguard the system against other computer infections. Driver Performer is a potentially unwanted application (PUP) which is detected as such by several computer security programs. If your anti-virus program has detected the program in question as suspicious, do not hesitate and remove it from the PC. If the security program is not powerful enough, install SpyHunter which will easily terminate the unwanted program. Tags: delete Driver Performer, Driver Performer, Driver Performer removal, remove Driver Performer.